Note: The demo transaction is in USD. 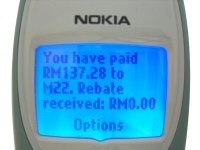 While in actual store, it will be in MYR (RM) since Mobile Money only do settlement in Malaysia Ringgit, period. 1) Mobile Money shopper selects product(s) to buy from merchant e-commerce website. 2) Mobile Money shopper views the goods in the shopping cart. 3) Existing shopper can login & checkout. First time shopper must register and checkout. 4) Mobile Money shopper selects Mobile Money as payment option. 5) Mobile Money shopper selects a shipping method. 6) The Order Summary is displayed before payment is made. 7) Mobile Money shopper fills up his/her mobile phone number (which registered with the bank) and last 4 digit of his/her IC number. Mobile Money shopper then clicks the button to purchase. webShaper e-commerce software will then request for payment via Mobile Money. 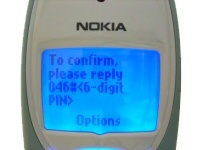 8) A confirmation message is displayed to Mobile Money shopper. 9) Mobile Money Merchant checks the order for the first time. At this point, the order status is "Pending" and Mobile Money has verified the request for payment (transaction) by webShaper is not fraudulent. 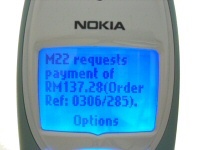 PAYMENT REQUEST SMS stating Merchant Name, Amount and Order Reference Number (by Merchant). 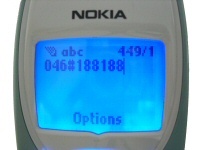 "046" is the 46 SMS received by the shopper. 10) There is a possibility the Mobile Money shopper may fail to respond within 30 minutes upon receiving the SMS requesting the Mobile Money shopper to confirm the purchase. VOID PAYMENT REQUEST Message for shopper not replying within 30 minutes. 11) If the shopper fails to respond, the merchant can request for payment again by clicking the "Request Payment" button. 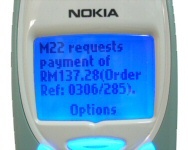 12) webShaper e-commerce software displays a confirmation message to Mobile Money Merchant. The software will trigger Mobile Money to resend a SMS to Mobile Money shopper to request for payment. 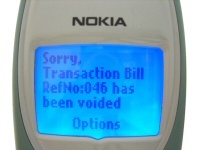 Mobile Money shopper will receive a new SMS which request for payment confiration. PAYMENT REQUEST SMS stating Merchant Name, Amount and Reference Number. 13) The Order Log states that the MM Merchant has requested for payment and Mobile Money has verified the request for payment (transaction) by webShaper is not fraudulent. 14) If there is no update on the order from Mobile Money after 30 minutes the request for payment was made, Mobile Money Merchant can enquire about the status of the order by clicking on the "Query Payment" button. 15) webShaper e-commerce displays a confirmation message to Mobile Money Merchant. 16) Mobile Money will then notify webShaper e-commerce about the status of the payment and the status is display in the Order Log. 17) Finally when the shopper approves the payment by replying the SMS sent by Mobile Money (refer to the SMS screen shot below), Mobile Money notifies webShaper e-commerce and webShaper e-commerce will automatically update the order from "Pending" to "Processed". Mobile Money Merchant is now ready to ship the product to a new happy customer! 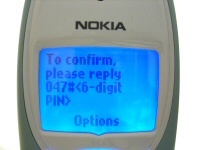 REPLYING SMS with Reference Number and 6-digit Security PIN to confirm payment. 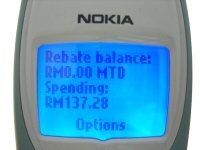 PAYMENT NOTIFICATION from Mobile Money, stating payment to whom (Merchant), Amount Paid, Cash Rebate, Total Cash Rebate, Rebate Balance and Month-To-Date (MTD) expenses. 1. There is no need of constant 24/7 monitoring when using Mobile Money with webShaper e-commerce. You will be notified via email / SMS* if there's new order placed by customer online. 2. Orders can be processed while you are asleep. 3. webShaper e-commerce software allows you to test Mobile Money transactions without a charge. However, you will need to apply for a test account from Mobile Money (subject to approval) and disable Live Mode in webShaper e-commerce's Payment Option Manager. 4. You can also request payment at any time. With webShaper, you can request for payment via Mobile Money as soon as Mobile Money shopper buys (Automatically) from your store or request at a later time (Manually) after assessing the fraud risk or after ensuring there is enough stock in the inventory. This can be configured in webShaper e-commerce's Payment Option Manager.